How to avoid the Akonadi PIM framework of KDE is a very frequently asked question. Akonadi is started when logging into a default KDE session – and includes a mysql server – this is a bit of a waste of system resources since (in my personal estimation) the majority of KDE users won’t use Akonadi for anything at all. So here’s how to make Akonadi not start in KDE SC 4.7. Disable KRunner runners that will start Akonadi. Press Alt+F2, click on the “wrench”, uncheck “Calendar Events” and “Contacts” runners, click on “Apply”. Tell the digital clock not to display calendar events. 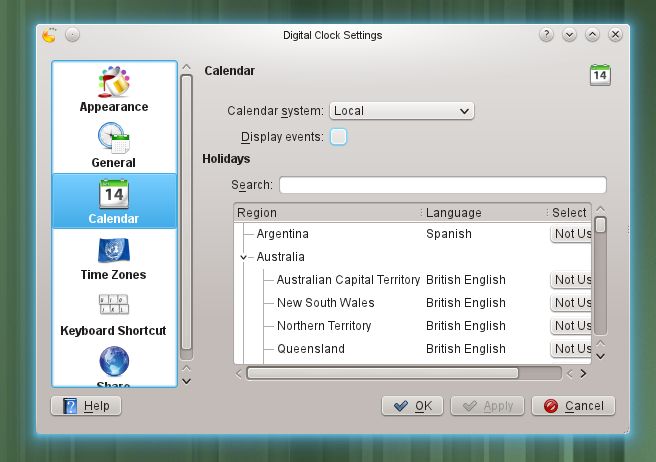 Right click the digital clock (in your panel), Digital Clock Settings, Calendar, uncheck “Display Events”, click “Apply”. Don’t use applications that need/start Akonadi, such as Kontact/KMail/KOrganizer, Konversation and Kopete. That’s it. Next time you boot Akonadi won’t start anymore – at least not until needed. Personally I’m a huge user of Akonadi and the applications mentioned above, so this post should not be seen as any kind of vendetta against Akonadi or KDEPIM developers or anyone else. The purpose is solely to help KDE users who – unlike me – don’t need Akonadi get a leaner and cleaner system. Akonadi is a soft dependency at runtime, as it is only started on demand, i.e. when an application wants to interact with it. Nice try but no cigar. It is not soft in terms of ‘not necessary to install’ without major function loss. I mean come on. KDE without kontact, kopete and konversation + restrictions on how things need to be configured… get real. Akonadi is a hard dep in this respect. No akonadi means severe loss of function. It is easier to package as a base dependency, but nevertheless a soft dependency at runtime due to not running when not needed. Making the use configurable for add-on functionality is one option, these apps could also check if it is running. When it provides the core functionality, e.g. in Kontact, neither of these option would make sense, since the application would be totally useless (empty, no data to work on) without. @ruurd : akonadi didn’t work at all for me up to now. Not work means: I’ve reported / found the first few bugs on bugs.kde.org. But there were to many showstoppers. To continue my daily work I had to switch to thunderbird. This week I gave kdepim-4.8.3 another shot. It worked out quite well – until akonadi began truncating my emails. It just deleted the body of all incoming emails on the server. To users like me your comment sounds a lot like cynicism. I’m glad I can avoid crippling mail mailbox for now by stopping akonadi. Thanks for the blogpost! Most KDE users, use either Thunderbird or web based solutions for mail and calendaring. And add a few people using text based clients or even Evolution. I’m guessing at least 98% never use IRC. Those who do will often use Xchat or irssi or other clients. I don’t know how many people use instant messaging. Maybe 20%? A substantial amount of those will use browser based stuff or pidgin or psi etc. While it might seem inconceivable to you, for most regular users, not using kontact+kopete+konversation is completely normal. I like the idea of Akonadi, but the current implementation is not very efficient. On my system, akonadi_mixedmaildir_resource is taking over 1GB of memory and opening my inbox (~10k mails) for the first time takes several seconds. Before Akonadi, Kontact with KMail+Akregator active took about 150MB of memory and displayed my inbox within a second. I notice on my system that In this case akonadi still tries to start itself several times during KDE startup until it reaches some number of tries or timeout. The result is a delay in KDE startup. You _need_ to configure Krunner and clock as shown in this post to prevent Akonadi from starting. akonadi had 50 processes running preventing anything else from running. I simply removed akonadi and nepomuk with my Mageia 2.0 software removal panel, and kopete still works! my entire system FLIES now! It is like I was towing an airstream trailer, and it is gone now! I tried to keep my beloved KDE and get rid of Akonadi and Nepomuk in various ways (breaking package dependencies / removing executables) but at one point this was simply not maintainable anymore. Now I migrated to XFCE4. 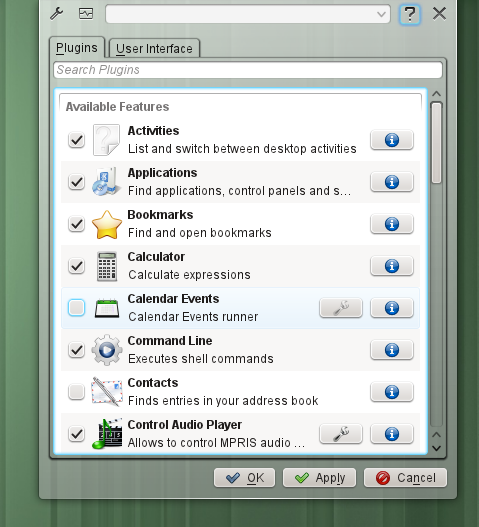 I hoped to be able to keep KDE various KDE applications. Unfortunately more and more KDE apps have a dependency on the “social desktop” machinery. A fork of KDE will remain a dream. However I hope that people will step up to fork KDE apps to remove all server dependencies. Moving apps over to Razor-qt might be a viable way. is what I do, and to all trolls in my gnu/linux system. And the # is real – how dare other people limit my privileges on my my own computer? to get the beloved # prompt.